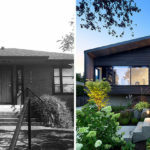 Enlisted by boutique builder Moosehead Contracting; Falken Reynolds Interiors and Randy Bens Architect designed a family home in Vancouver, Canada, to fit on a unique lot size that measures just 20 by 200 feet (6m x 60m). 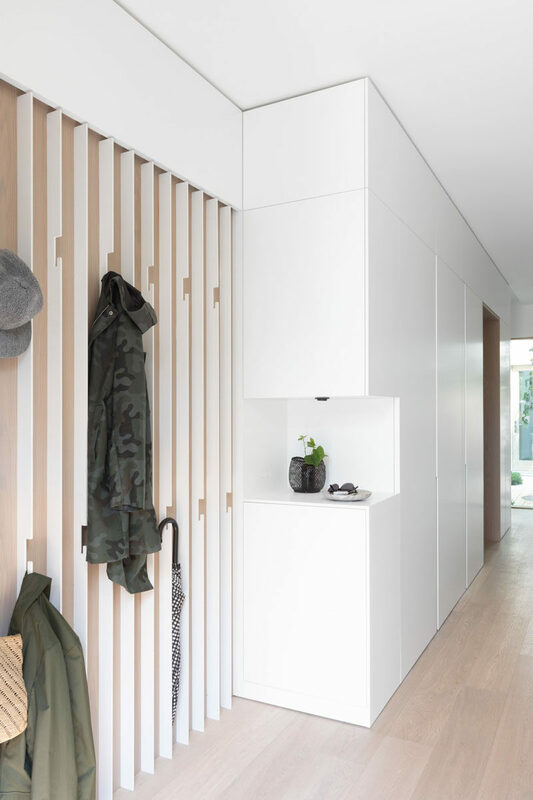 Inside, there’s an entryway that features a wall of bespoke slatted steel coat hook, and a small open shelf cut out in the white cabinetry. 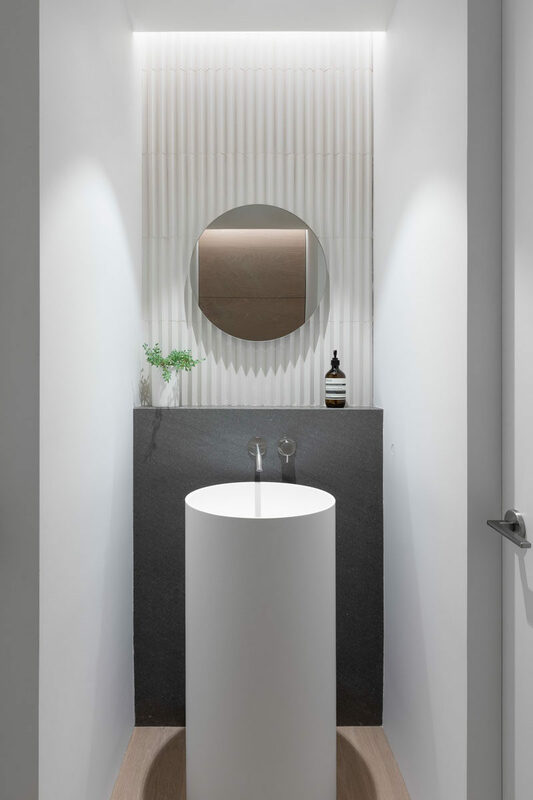 Within the cabinetry, there’s a door that opens to reveal a powder room with a pedestal sink and faucet, a Basalt ledge, and Mutina tile on the wall. 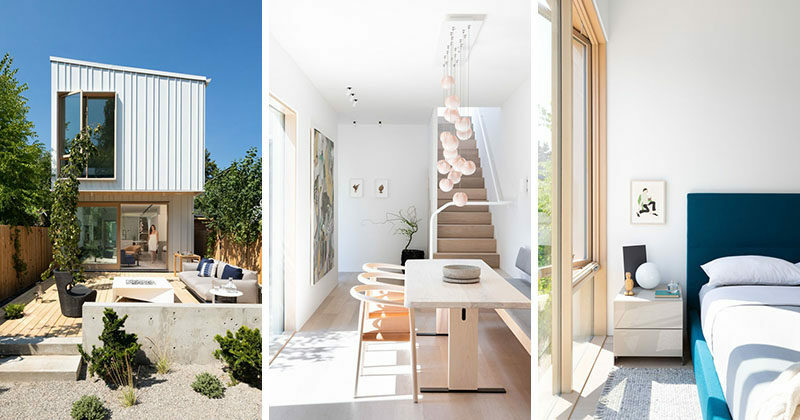 Further into the home is the dining area, which has a view of a small courtyard. 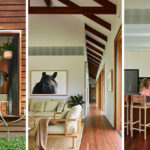 The courtyard was created to bring light into the center of the home, and is a quiet place to relax. The kitchen has white lacquered cabinetry with oak finger pulls, Corian Quartz counters and gables, as well as backsplash and kicks. 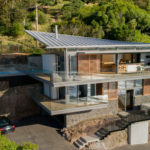 There’s also integrated wine and coffee appliances in white glass to match, and open shelving behind doors that tuck away. 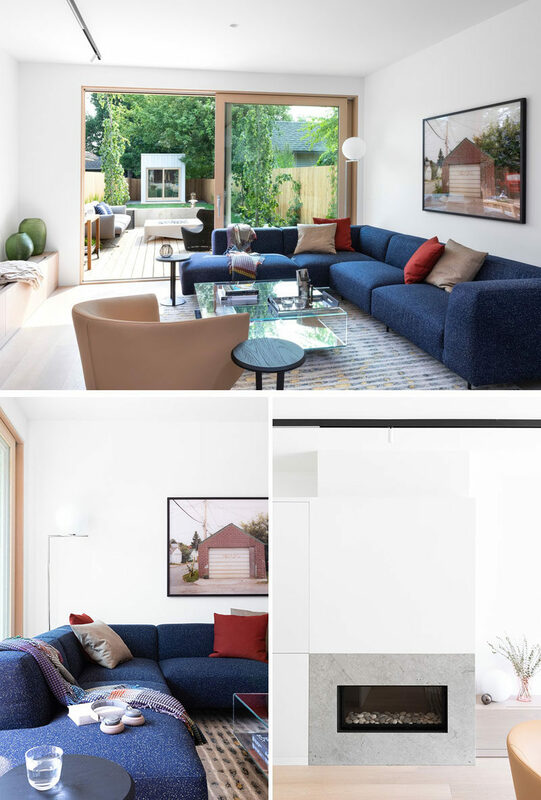 In the living room, there’s a bright blue couch for a pop of colour, and a flush limestone fireplace. 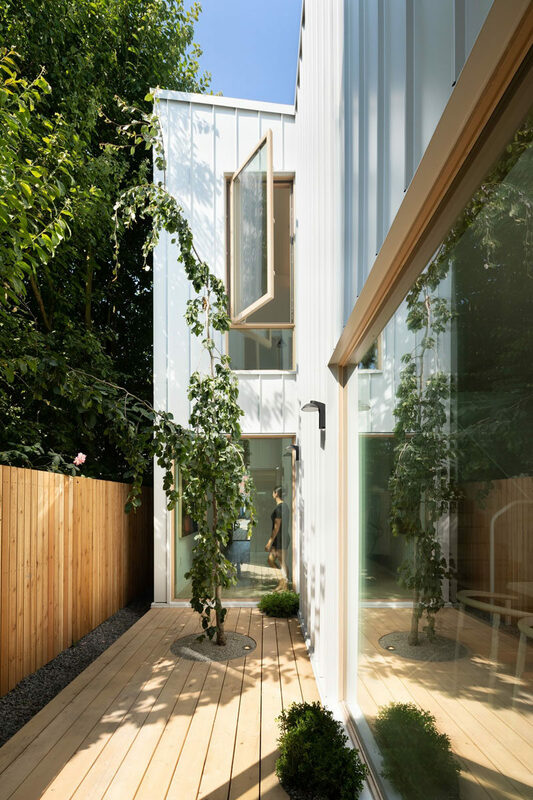 A Lift & Slide door opens the space to patio and garden beyond. 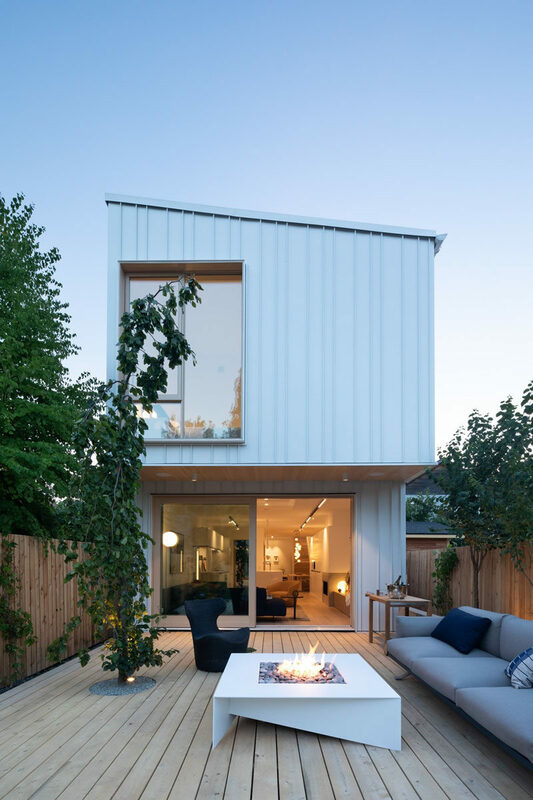 The back patio, which is made from wood, is home to a couple of trees and an outdoor living room with a fire table. Back inside, the stairs have slatted steel guards that intersect Nordic Oak treads. 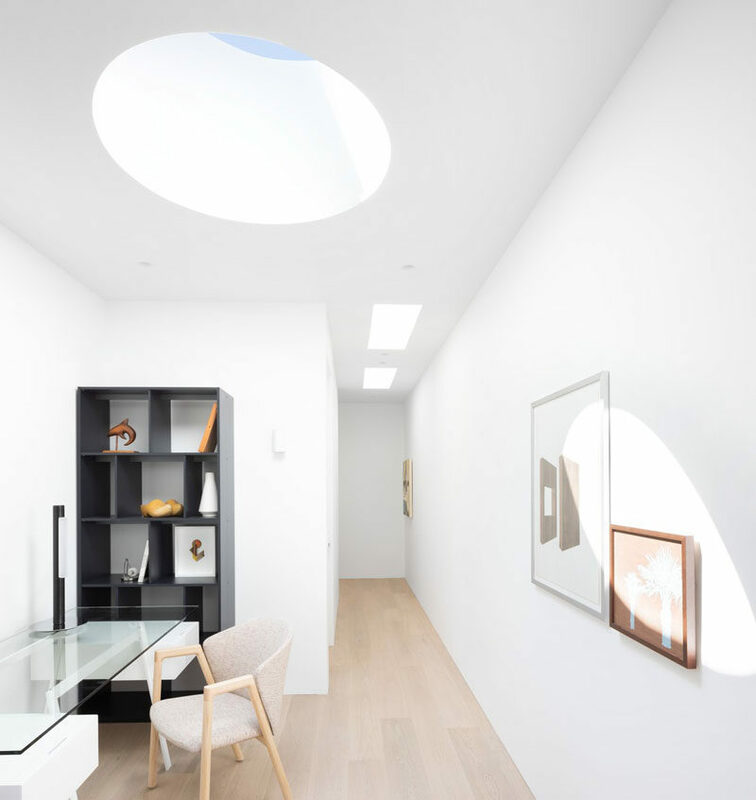 At the top of the stairs, there’s a skylight that provides natural light to the landing. 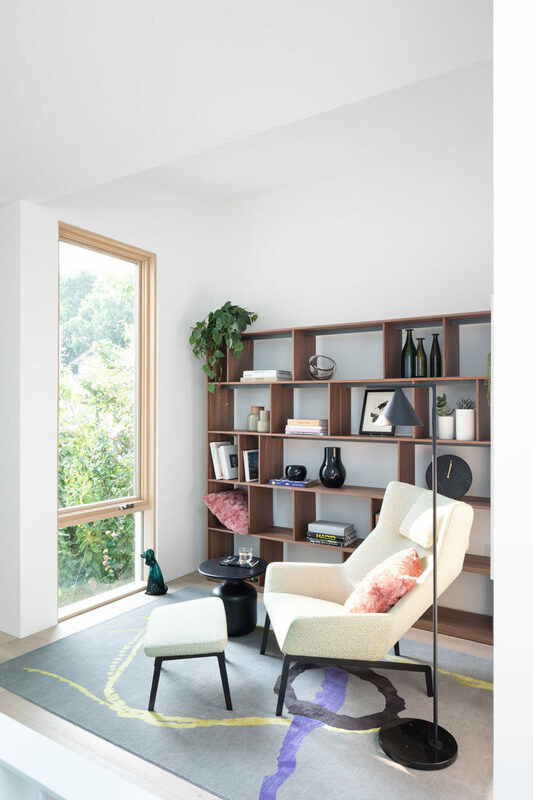 Heading towards the master suite, there’s a small den / home library space with a comfortable chair, wood shelving, and view outside. 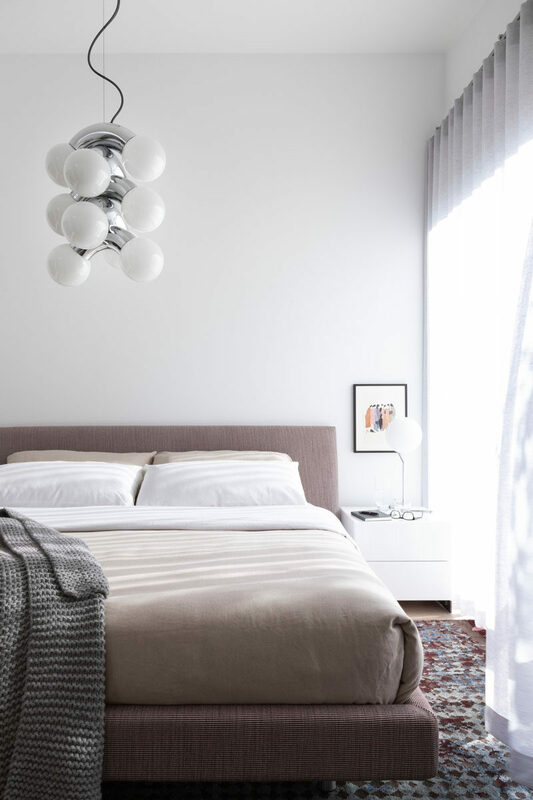 In the master bedroom, a neutral color palette creates a calm space, while a AndLight Vine 5 Pendant hangs from the ceiling. 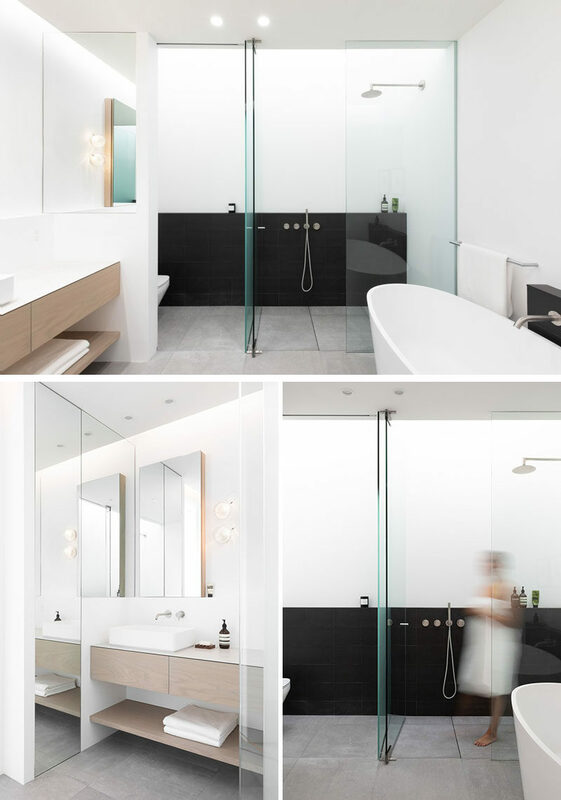 In the master ensuite bathroom, there’s a skylight above the shower that creates a soft diffused light, while black elements contrast the mostly white room. Back out by the den, there’s another space that’s been designated as a study nook in the “kids’ zone”. 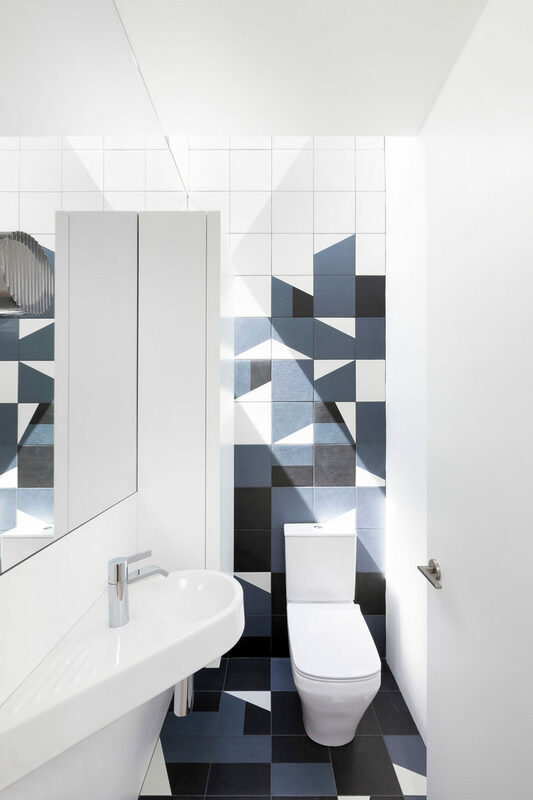 There’s also another powder room, this one has bold geometric tiles in blue and black. 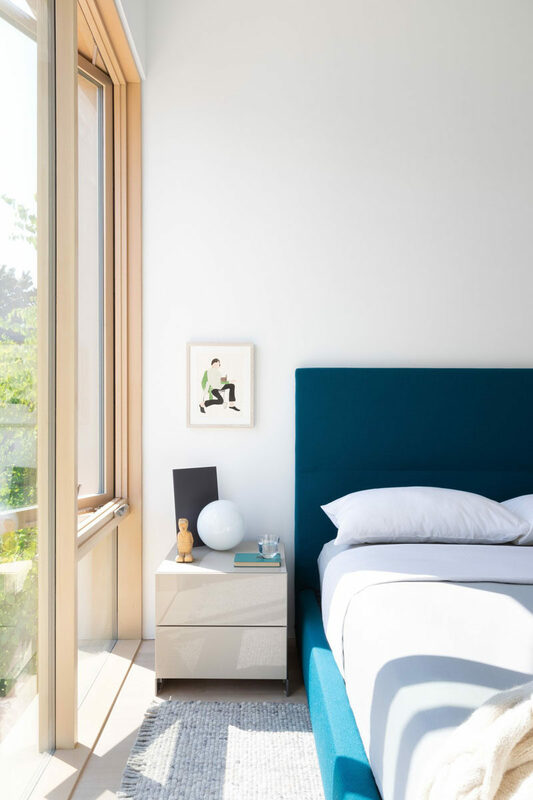 In the guest bedroom, the furnishings have been kept simple, with a blue bed frame adding some color. 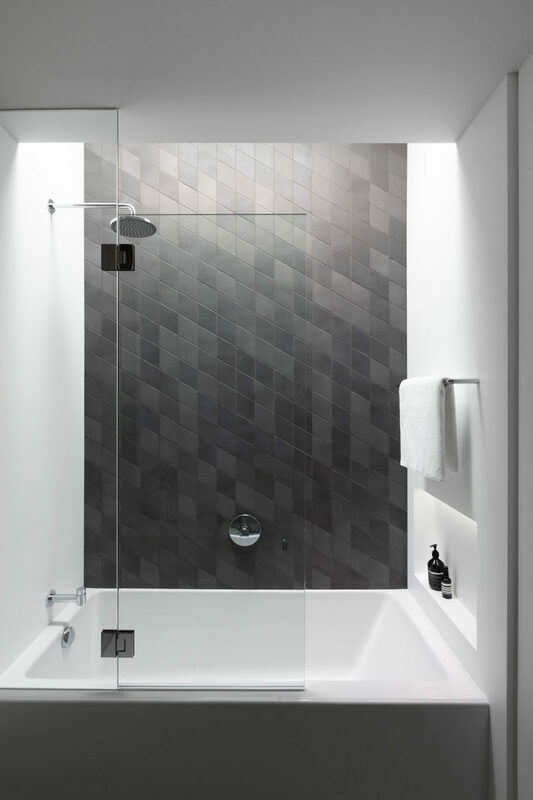 In this bathroom, dark tile has been used to create an accent wall, and a small built-in shelf with lighting at the end of the bath provides a place for storing bottles.